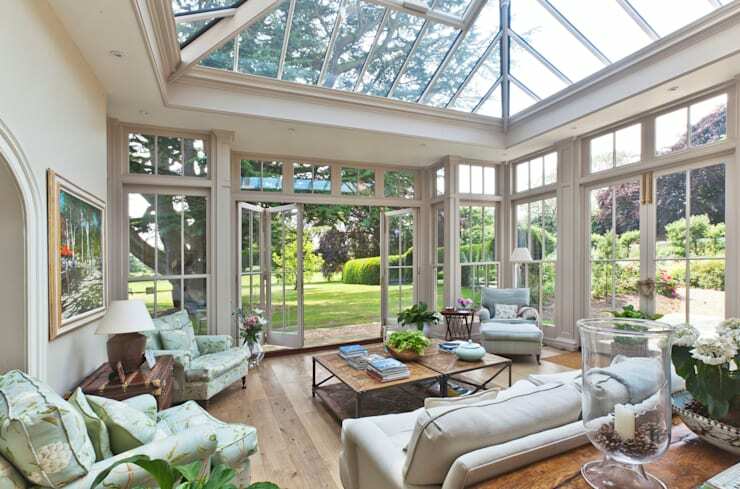 A conservatory, or sunroom, is a quintessential element to so many British homes. By definition, it is simply a room made of glass walls and roofing, used as a greenhouse or living space. Traditionally used as a place to cultivate plants for food or otherwise, conservatories have developed to also become a room for us to sit and enjoy the surrounding landscape of our homes while being protected from the cold, wind, and rain. Often built as an extension of the home, there is many factors to consider when building a conservatory. Firstly, consider what your conservatories main purpose is; for growing plants, or is it an extension of your floor plan? This will then be the deciding factor on elements such as flooring, decoration, ventilation, and glass finishings. We love this cozy nook of the home, so we thought it would be a good idea to share with you some great examples of conservatories used as living areas, to allow us to hold onto the outdoors lifestyle well into the colder months. Who wouldn't want to spend every possible hour in this amazing take on a conservatory? Designed by Vale Garden Houses, who seem to do no wrong when it comes to sun-rooms, this conservatory hits the nail on the head when it comes to sunlight, elegance and warmth. Sash windows of different sizes frame the room perfectly, allowing the occupant to take in the wonderful garden view. On top of this, the glass roof allows the room to be drenched in sunlight. Many plant species would thrive year round in this room, taking full advantage of this by placing a number of pots around the room. We recommend you check out the other projects from Vale Garden Houses by clicking here. A sunroom would not be a sunroom by definition, without the use of glass panels to allow in maximum light. The type of glass you opt for will greatly effect the cost and insulating properties of the room. A single glazed sheet of glass is one single pane, meaning it is much more cost effecive, but will not allow the room to be enjoyed to its full potential through all four seasons. Double glazed is two sheets of glass filled with air or gas between the two panes, allowing for better insulating properties. Triple paned glass is the same principle as double paned, but with an added layer. There is also a number of options of gas to fill the space between the panes, so research your options thorughly to make an informed choice based on budget and your rooms particular needs. Although a sunroom is a great place to spend time when the weather outside does not allow us to be out amongst the greenery of our gardens, a sunroom will get just as much use as soon as entertaining season rolls around in spring. Perfect for entertaining, this sunroom blurs the line between the indoors and out, with bi-fold doors being used to line the complete length of the room, allowing the yard and room to become unified. In an area such as this, the choice of flooring is another important element. Kids will be frequently passing through the doors, from the pool and on the grass to come inside, so be sure to pick a floor that is not too delicate. Traditionally easy to maintain floors such as tiles by themselves are not ideal for winter, but when used in conjunction with heated floors or insulation can be the perfect choice for year round use. 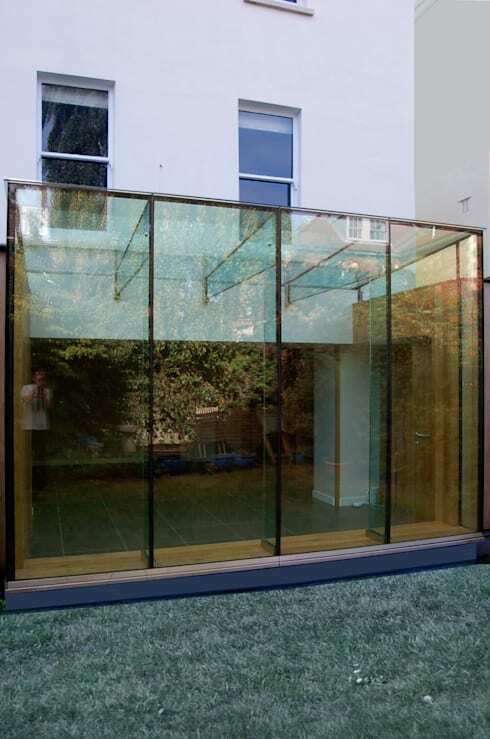 A room made up almost entirely of glass does not allow for much privacy, but with the popularity of conservatories many blind companies have come up with some practical solutions. Specialty sunroom blinds allow for privacy to be maintained, without the stability of the structure being jeopardised. Interior designers and decorators Fisher ID have done a great job in this monochrome sunroom located in north London's highly sought after Hampstead. The bespoke curtains allow light to still pass through into the room, while blocking out visibility from prying neighbours. This opulent home really is something else, and we recommend checking out the whole project! A conservatory in a country home is the perfect spot to spend a lazy Sunday. No need for blinds here, as the neighbours are nowhere to be seen and the rural view is too picturesque to cover up. In a rural setting, where space is not so tight, the aspect of a conservatory should play a big part in the design. Here in the northern hemisphere, a south facing aspect will attract more sun, whereas in the southern hemisphere, this theory can be reversed. With a little time and consideration on all facets of a sunroom addition to your home it can become a favourite room for your family to spend time and can add serious resale value to your home. Do you have a conservatory in your home? How is it used? Let us know in the comments section below.